A Dictionary of the Bible is the most acclaimed, accessible, and up-to-date dictionary of its kind. Containing over 2,000 authoritative entries it provides clear and concise information about all of the important places, people, themes, and doctrines of the Bible. Terms range from earthquakes and mice to martyrs and art, and new to this edition are entries on Act of God, Old Testament and New Testament theology, Hanukkah, the Koran, mysticism, and many more. This dictionary features a detailed bibliography, biographies of Bible scholars, a conversion table of measures, weights, and values, a chronology of important dates in Biblical history, and historical maps (showing Israel in Canaan; the near east in the time of the Assyrian Empire; Palestine under the Herods; the background of the New Testament; Rome and the East). In addition, entries on the books of the Bible have been grouped in alphabetical order and conveniently located in a tinted centre section for quick reference. Recommended web links in the appendix provide valuable extra information, these links are accessed and kept up to date via the Dictionary of the Bible companion website. 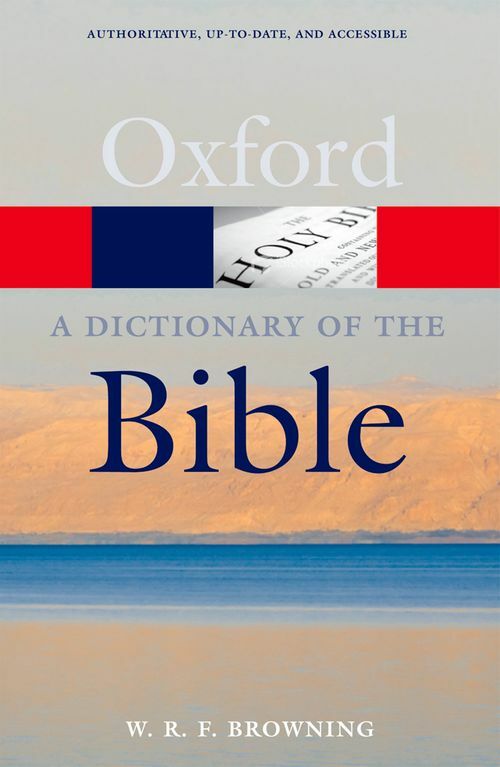 With lively and informative A-Z entries and an array of useful supplementary material, this dictionary is essential for students and teachers of theology and religious education, and it is an absorbing reference work for all readers of the Bible. W. R. F. Browning has been a Canon Residentiary of Blackburn Cathedral and of Christ Church Cathedral Oxford. He is now an honorary canon and an honorary priest in West Oxford. He was for thirteen years a lecturer in New Testament Studies at Cuddesdon College, Oxford, and at the Oxford University Department of Continuing Education. His books include Commentary on St Luke's Gospel (1960; 6th edition 1981), Meet the New Testament (1965), The Anglican Synthesis (1965), and Handbook of the Ministry (1985). In 2008 he was awarded the Cross of St Augustine of Canterbury for work in theological education.